Two days ago I visited Centennial Park and I could only see the top of the roof of the canteen building near the pond. 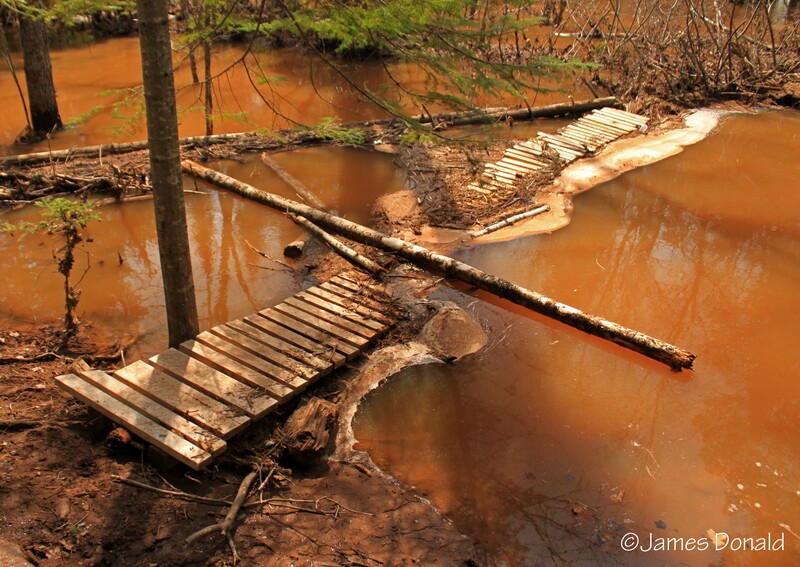 At that time most of the trails and parks in the city of Moncton were underwater. The floodwaters had receded since then. 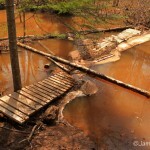 I read on the City of Moncton website that the Humphrey Brook Trail was open again. I’d checked out the trail for the first time a few days earlier when it was still closed. We had just dropped off some kids and thought it would be a great way to spend a beautiful spring day. I had also read something online about a trail on the Crowley Farm Road that I wanted to find but when I passed there the other day the road was underwater. We took the exit from Wheeler Boulevard and saw that the Crowley Farm Road was no longer closed. We turned left to go see if we could find the trail that I had read about online. 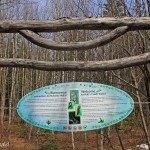 After a short distance we saw some cars parked along the road and soon saw a sign at the start of a trail. We decided to explore this trail and leave the Humphrey Brook one for another day. We parked, got our boots on, then went to read the sign at the trailhead. It showed that this was the Hall’s Creek Trails and that there were trails on both sides of the brook. 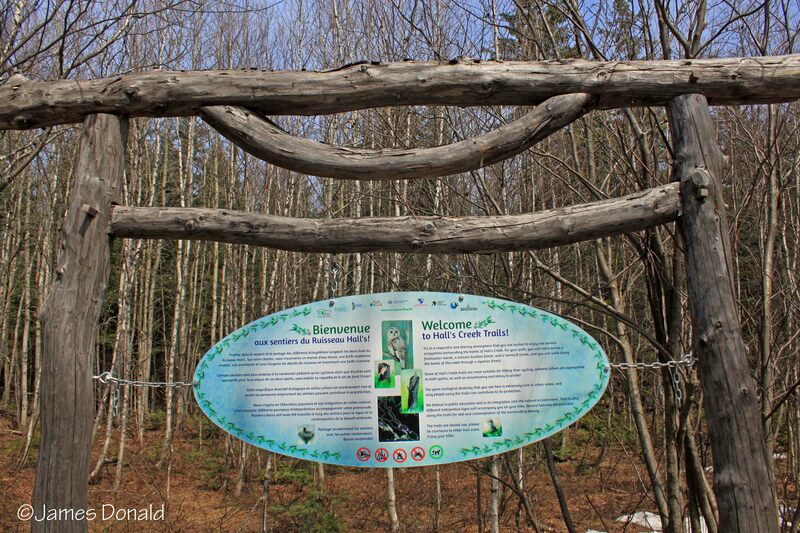 The trails traveled between where we were standing and the the Trans Canada Highway. The trail was covered in snow, which looked like it was packed from snowshoe traffic in the winter. In a short distance the snow disappeared and was replaced by mud. The mud was in small patches that were easy to navigate around. The rest of the trail was a mix of packed snow, ice, mud and hardpack. Perfect spring conditions. There were many small boardwalks that crossed the really wet parts and several small bridges to cross streams. The creek flowed beside us on the left and we could see that it was wider than it’s usual channel. We came to one opening and spooked a couple of ducks swimming in a wide part of the stream. We passed several benches and a large interpretive sign about soil compaction. We came to a small lookout platform that had another interpretive sign about bald eagles. There were two girls already at the platform debating about what they could see in the trees across the stream. One of them said it was a bald eagle and the other one disagreed. 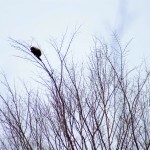 When we got closer we could see that it wasn’t a bald eagle. 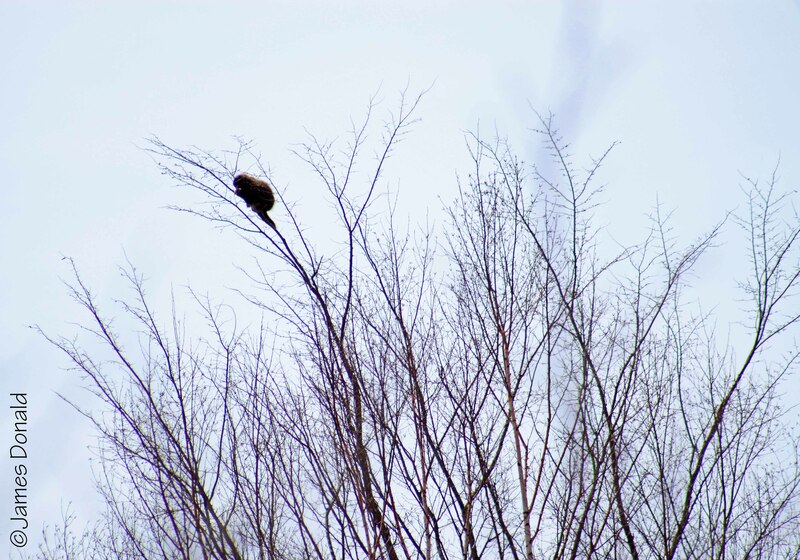 I lifted the camera with the zoom lens and was surprised to see that it was a porcupine at the very top of a hardwood tree on the very end of the small tip. Before we left Vicki pointed out that there was a bald eagle nest in the white pine tree to the right of the porcupine. We continued on and soon found large piles a wood chips near some of the trees. There were large holes in the trees where the woodpeckers had been busy. We soon saw three male Downy Woodpeckers and a female Downy fly by and land on the tree next to us. We took lots of pictures as they climbed the trees looking for food, then we continued on. We passed a couple more interpretive signs. One described the Acadian Forest and one was about Water Quality. After a short distance the trail veered sharply to the left and straight into the stream. There were several section of boardwalk floating in the floodwaters. 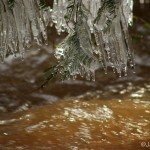 It looked like the next part of the trailed traveled up through the floodplains of the stream that was now underwater. We decided to climb the hill away from the stream and look for the return trail that ran through the woods farther from the stream. We crossed a pipeline right of way. and continued back into the woods to find the return trail. We soon found the packed snow of the former snowshoe trail that followed the return trail. We turned left on the trail and continued heading heading upstream. We wanted to see if we could find the other end of the trail where it emerged from the water. The trail followed along a ridge looking down at the stream. The trail eventually dropped down into the valley to the shore of the stream. 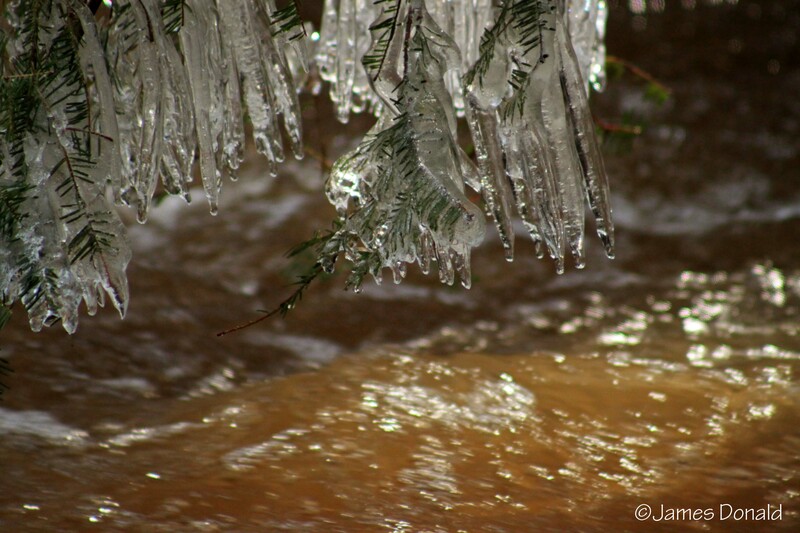 We took pictures of the icicles that formed on the tree branches that were low enough to hang into the flood waters. They contrasted nicely against the deep brown waters. We started following the trail back downstream. It soon climbed back up on the ridge and then down again into the stream floodplain. You could see how all the old dead grass had been washed in one direction by the waters that had covered this area a few days ago. The water had dropped enough so that we could now follow the trail on the floodplain. Eventually we came to a small split in the stream and more pieces of washed up boardwalk. This was as far as we could go on the trail without getting trapped between the two branches of the stream. We once again climbed up out of the stream valley to find the return trail. We followed the return trail back towards the car until it merged with the original trail. On our way back to the car we could see views of the hospital through the trees across the stream. Once back to the car we kicked the mud off our boots and headed for the Miramichi. The Humphrey Brook Trail would have to wait for another day.